Way back in the dark ages (I worked graveyard shifts then, it was dark! ), when I taught myself to knit, I did it for exactly one reason: I was under the impression that it was impossible to crochet cables. I love cables. Unreasonably so, even. So when I discovered that it is in fact possible to crochet a cable, I was in hog heaven. I love the instant gratification of crochet (it is so much faster for me! ), and it is much gentler on my poor wrists than knitting is. In the intervening years, I had always assumed that the crochet cable love must be spreading, if not into common knowledge, at least into common knowledge in the craft world. Then I began designing. Cables flowed from my hook. I haven’t published anything that I consider particularly complicated yet, but I keep coming up against one big problem – most crocheters don’t know you can crochet a cable, much less how. But you know what the big secret is? It’s not that hard! So come with me while I give you a solid first lesson in the secret of the crochet cable. It’ll be lots of fun, and there will be yarn! For practice, I suggest a DK to worsted weight yarn in either a bright color, or a very pale one, as your stitches will be easier to see than if you used a dark color. Use any hook you’re comfortable with for your specific yarn. When in doubt, I recommend going with a slightly larger hook than you usually would while you’re learning. I’m using Berocco Touché with a 6mm (J) hook. There are two main ways to do crochet cables – using front post/back post stitches (equivalent to having cables in knit stitches surrounded by purl stitches in knitting) and using regular stitches (equivalent to knit-only cable patterns in knitting, such as honeycomb cables). This tutorial will teach you how to do both. Start out with your preferred foundation method, and add a couple of rows of single crochet, just to have a place to start from. I started with 24 stitches, but you can really do as many or as few as you like, as long as it’s a multiple of six. I recommend at least 12. Row 1 (and all WS rows): Fpdc, bpdc4, fpdc; repeat across. Ch 3, turn. The next row is your cable row. We will be doing cables where you go in FRONT first – if you’re right handed, that’s a left twisting cable; if you’re left handed, a right twisting cable. Note from here on out, the right handed picture will be on the right, and the left handed picture will be on the left. Row 2: Bpdc, skip 2 stitches, fptr in next two stitches, going in FRONT of (or BEHIND) fptr just completed, fptr in each of the 2 skipped stitches, bpdc; repeat across, ch3, turn. That is all there is to cabling, really! On the next row you repeat your set up row again. The cabled stitches will be sort of bunched up, but just work them in order. 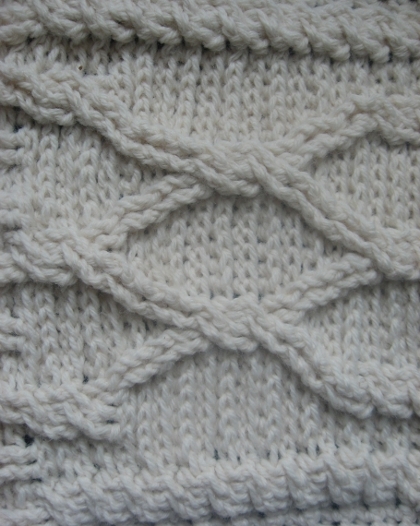 In the above examples, your cables (done in front post stitches) are separated by a contrasting stitch (back post stitches). Another way to cable is to have no contrasting stitches. In crochet, it makes the most sense to work in the tops of the stitches for this look, rather than the posts. Row 2: hdc, skip 2 stitches, dc in next two stitches, going in FRONT of (or BEHIND) dc just completed, dc in each of the 2 skipped stitches, hdc; repeat across, ch3, turn. this prevents you from getting a funny extra loop across the front of your cable, as well as being just plain easier. All cables – up to and including the most intricate braided cables – are just combinations of right and left twists of varying widths. When you think of it that way, it’s not nearly as complicated as it looks! And seriously, there are few things more complicated looking than cables. So go forth and spread the word – these twisty stitches aren’t just for people who play with sticks! Kim learned to crochet as a child, but it never really took until she got stuck working the night shift at a hotel front desk. Yarn filled those long quiet hours quite nicely! She currently lives in Colorado with her husband and three little girls, where the harsh winters inspire her to create all manner of warm woolen goodness. When not completely overwhelmed by her urge to do it all, she gardens, spins, and reads comic books. You can check out more of her crocheted cables here. Tutorial & images © Kim Driggs. All rights reserved. OH MY GOSH, I can’t wait to try this! I love cables, and can’t knit worth a darn! I am so excited to try this!! thank you thank you thank you! What a great tutorial! Thanks for sharing it with us. Great tutorial! Very easy to understand & follow. Thanks! Great tutorial! I can’t wait to try cables now! Thank you for sharing it with us! Thank you so much for this informative article, I can’t wait to try crocheting cables!!!!! This is a great tutorial. I have been crocheting for 60 years and I’m always looking for something new to learn in this wonderful art form. Now I know what I’ll be learning this winter. Thank you so very much. into crochet and this cable pattern is one of them. Terrific! Terrific, absolutely a good pattern for sharing. One qustion: how do i prevent toe little holes around the cables (like the ones seen in the bottom picture of the post stitch cables)? I think the holes add to the beauty of the crochet cables. But if you don’t want them so pronounced some suggestions would be to add more tension to your yarn (squeezing your fingers tighter together on your left hand)right before you go into the cable stitch, or you could try using a smaller hook size than what is suggested. I love this. I also love cables and would love to see more crochet patterns with cables. Thank you for sharing. oh my god. thank you so much for posting this. this has been the most helpful thing ever!!! I am having a little trouble with the step about going in front of the fptc just completed, that part is slightly confusing. but thank you soooo much!! WOW!!! This is so exciting! I always thought I wouldn’t be able to do cables, because I don’t knit, but this makes it so easy and it is crochet. Thank you so much, this is most kind of you. super awesome but how do you do right facing cables? i can only do left. I want you to know how much I appreciate the left-handed pictures. I cannot tell you how often I turn down a pattern because I had trouble figuring out how the stitch is supposed to look when the pattern is from a right-handed perspective.